Midland, MI – First baseman Eligio Sonoqui picked up another two-out RBI for the Hot Rods on Wednesday night, but it wasn’t enough as Bowling Green dropped a 9-1 decision to the Great Lakes Loons (24-15). The loss evens the series at one game each heading into the finale on Thursday morning. Sonoqui’s clutch hit came in the top of the fourth inning with Bowling Green already trailing 4-0. Tyler Bortnick began the inning with a single, steal second before Mayo Acosta drew a one-out walk. After Dustin Biell struck out, Sonoqui smoked one into center field to score Bortnick to put the Hot Rods on the board at 4-1. 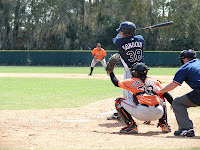 The hit came one night after Sonoqui picked up a two-out double to deep center field in the eighth inning on Tuesday. He now has eight RBI on the season, three coming with two outs. The Loons started the scoring first, wasting no time getting to Aaron Dott, who was making his first start after being added to the roster to take the place of Shane Dyer. After back-to-back lead-off singles, Jerry Sands picked up a one-out RBI with a single to center field to put the Loons up 1-0. They ended up loading the bases before the end of the inning, but Dott induced Lenell McGee into an inning-ending groundout to end the threat. In the second the Loons broke the game open with a three-run rally against Dott. Gorman Erickson began the inning with a single, taking second when the ball skipped by Chris Murrill in left-field. He advanced to third on a single by Rafael Ynoa. Ynoa then stole second before Christian Lara grounded to third for the first out of the inning. Dott loaded the bases by hitting Brian Ruggiano. Brian Cavazos-Galvez then hit Dott with a bases-clearing double into the left field corner to put Great Lakes up 4-0. Dott would last one more inning, giving up a walk and a two-out double, while adding a pick-off to the mix. He lasted three innings total, surrendering four runs on seven hits, a pair of walks, and a hit batter. Loons starter Brett Wallach would work six total innings, allowing just the RBI single by Sonoqui. He gave up five hits, walked two, and struck out five to improve to 3-0 on the season. The Loons tacked on some late runs for Wallach, getting a run on a double-steal in the bottom of the fourth against Jairo De La Rosa. They tacked on a solo run in the sixth as Cavazos-Galvez homered against Alex Koronis. In the seventh, they got to Koronis for three more runs, two of them scoring on bases-loaded walks by the Hot Rods’ right-hander. The series now comes to an end on Thursday morning as RHP Jason McEachern (1-4, 5.45) faces Loons RHP Matt Magill (0-0, 2.70). First pitch is at 9:35 AM CDT. You can follow the game with Tom Gauthier beginning at 9:20 AM CDT on 1340 AM WBGN and www.bghotrods.com. The Hot Rods return home to begin a 13-game home stand on Tuesday, May 25, against the South Bend Silver Hawks (Arizona Diamondbacks). The first game of the home stand is one of six games that will benefit Warren County Parks and Recreation. Any fan that purchases a $10 regularly-priced box seat ticket for that night’s game using the promotional code “WCPARKS” (use all caps) will help recover Warren County parks damaged by recent flooding. Fans can use the code at the ticket window, by calling 270.901.2121, or at bghotrods.com. The Hot Rods will donate a portion of tickets sales from those six games to Warren County Parks and Recreation. For the complete list of dates and a full listing of upcoming promotions, visit www.bghotrods.com.